A strange mixture of the bizarre and the boring permeates What Time is it There?, the new film by festival favorite Taiwanese director Tsai Ming-Liang (The Hole, A Conversation with God). There is little else in the film except for Tsai's very strange sense of absurdist humor, and the lack of everything else makes it seem stranger. What Time focuses on three connected individuals and their experiences. It seems that these people coast through life, oblivious to the happenings around them. They are all missing something in their life, and it comes out in the way they behave. A mother mourning the death of her husband, her son who sells watches on the street, and one of his customers who move to Paris all share feelings of loneliness, but do little to resolve this. There are two noticeable elements in What Time is it Here? : the lack of dialogue and the lack of camera movement (and a fascination with urinating in anything but a toilet, but that's an entirely different matter). Tsai never tracks the action on screen. Every shot is stationary for its duration. Doing this focuses all attention on whoever is on screen at the moment. It allows everything in the background to wash over one's senses. The only thing moving is usually the actor, and sometimes that isn't the case. There is no music until the end credits, and even then it finishes before the credits are over. The dialogue is sparse, so when somebody actually says something, it forces the audience to listen. Moreover, the things that Tsai and co-writer Yang Pi-Ying (The Hole, The River) have their actors say are so strange that when those are the only lines, they seem even stranger. Mother (Lu Yi-Ching) believes her husband is coming back. She is living in a delusion, holding on to his memory. She will not let her son Hsiao-Kang (Lee Kang-Sheng, The Hole, Ordinary Heroes) kill a cockroach, since it may be her husband. 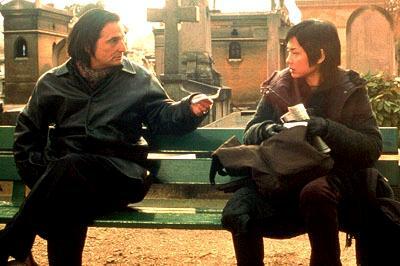 She cooks for him and sets a place at the table for him, much to the bewilderment of Hsiao-Kang. He seems to do nothing except sleep and sell watches. Shiang-Chyi (Chen Shiang-Chyi, Half of Heaven, Restless) is moving to Paris, and wants a watch that can show two times. She wants to have Paris time, and to see what time it is in Taiwan. The only watch she wants is Hsiao-Kang's personal watch, which he initially refuses to sell. In Paris, Shiang-Chyi succumbs to utter loneliness. She does not know anybody there. Her presence greatly affects Hsiao-Kang, who begins to compulsively set all clocks to Paris time. Tsai's use of humor contrasts nicely with his overbearing sense of melancholy. These are three extremely sad people, trying to cope by falling into a routine. They can do their routines mindlessly without worrying about anything else. Lee and Chen stare out aimlessly into space, lost in their thoughts for most of the movie. What Time is it There? refuses to hew to any sort of standard narrative convention. It moves at a snail's pace before exploding with activity (well, relatively exploding) near the end. This is a fascinating movie, however, do not see this movie tired. For some, it will be a perfect cure for insomnia. 1 hour, 56 minutes, Mandarin, French, and English with English subtitles, Not Rated but contains some mature themes, an easy PG-13.